This entry was posted in gmaps.kaeding.name and tagged cartography, maps, programming, scala. Bookmark the permalink. Post a comment or leave a trackback: Trackback URL. Is there a way to delete locations once they are mapped? I am a sales rep in a new territory with a small company and this program is really helpful. But I will be tweaking my locations as I go so I need to be able to delete. Thanks! Then, just save the map (keeping the name the same, so it overwrites the existing map). I cannot figure out how to save a map. I did get all the points on the map, but that is as far as I can get. I just typed in 50 locations but can’t figure out how to get the map back! I even saved it. Thought I was going to have to redo it, but when I tried to give it the same name it said “This map is already taken.” When I click on My Maps, it doesn’t come up. Hope you can help. The only map I can find associated with your account (I searched using the email you gave on the comment) is Central New York District of the Wesleyan Church, but it only has 5 locations. If you used the ‘bulk creation’ tab, it is possible that the addresses were still geocoding when you hit ‘save’. There should be a spinner on top of the address entry form while the geocoding is happening to indicate that it is still working, but I should add a check to prevent the map from saving while this is happening. Is there a way to save a map to my iPhone? When I travel I’d like to be able to access it even when I don’t have internet. Thanks! I’ve plotted several coordinates (DD MM.SSS) and they seem to be plotting the nearest street address which is meters away from the destination that I am trying to locate. Is there a way to have the coordinates posted. I am plotting readings taken from my hand held GPS. The only way you can save the map for offline use is to use your browser’s ‘print’ function to save it as a PDF file. You can then take that file and open it on your phone. It won’t be as fully-featured as the online version (you can’t zoom in/out, or scroll around, since those operations need to contact Google to get the map data), but it is better than nothing. Try entering the locations as decimal coordinates, rather than minutes & seconds. The code isn’t smart enough to handle both formats right now. You will have a chance to choose a name for the map, or you can leave the field blank, and a random gibberish name will be generated. Once the map is saved, it will reappear, this time with the numbered markers. I have created a map and make the locations i want. But how can i embed this map for my website. Before it i normally uses iframes for that. Here in what way i should go? 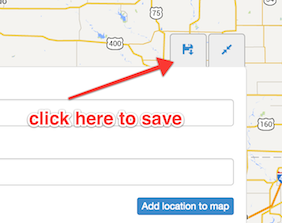 Once you created a map, you can link to it from your website. 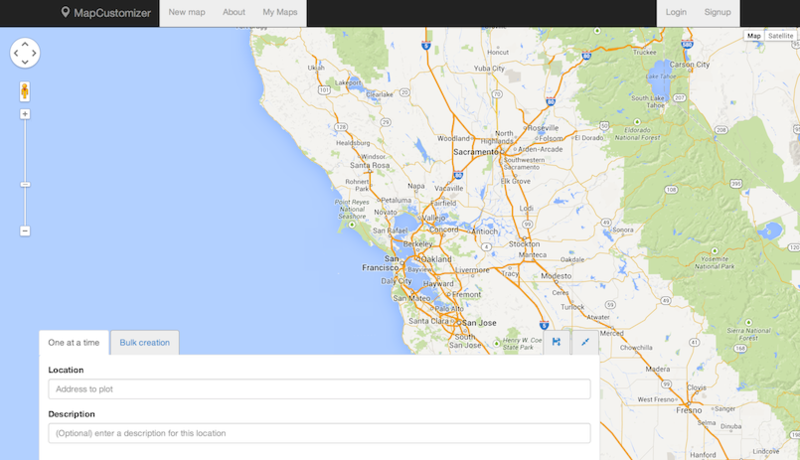 The service is not designed to make it easy to embed maps in your own site. 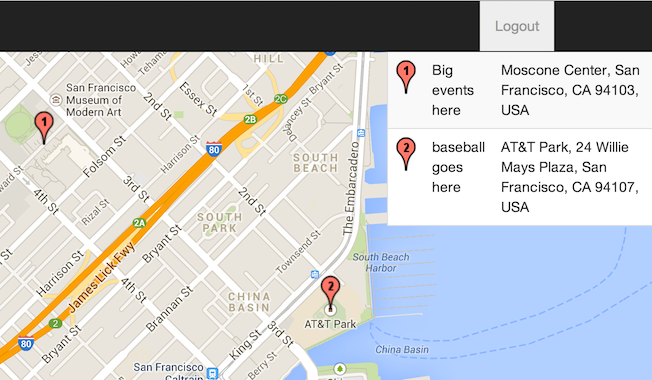 For that, I suggest you read up on the Google Maps API documentation. Is there away to remove the numbered location markers and just have a solid location maker? No, it isn’t possible to have an unnumbered marker right now. I am working on some ways to support different colored markers, so will see if I can incorporate a way to turn off the numbers into that work. Love your site. Is there a way to rearrange the addresses? Is there a way to print out directions from address to address? Any other helpful hints? I have it saved nicely. I’m glad you like the site! To answer your questions, there is no way to rearrange the points, except by removing them, and re-adding them in the desired order. This is something that a few people have asked for, though, so I’d like to add the feature when I get a chance. You can print the map using your browser’s built-in ‘print’ functionality, but there is no directions feature (again, this is a pretty commonly-requested feature, and it is on my to-do list). How hard would it be to add an x mile radius around a certain plot? i know you do this in your spare time so that is just a question. This would be really helpful for my job! That is an interesting question, though I am not sure how useful it would be for the average user of my site. I don’t think it would be technically difficult to do, but my main concern is that one-off features that are only relevant to a small number of users would clutter the user experience, and make it difficult for everyone else to use the site. That said, for your specific application, you could probably do it pretty easily with the Google Maps API directly (depending on how technical you are). Is there a feature to join the plotted points.. This is a great tool and many thanks for the creation. I am looking for a way to edit the descriptions I have entered in a saved map. Is that possible? It is not possible to edit descriptions directly, but it is possible to edit the entire map, and then remove or add points from the map. So, you can kind of accomplish the same goal, by removing the old locations, and adding the modified locations. It isn’t a smooth process, though. I plan to make this easier to manage in the future. I’m not sure what you mean by ‘join the plotted points’. If you mean to combine the points from two maps into a single map, no, that is not possible. I came upon this mapping tool while looking to discover a centralized meeting place for members of an organization I belong to. It was a great help–and everyone appreciated being able to see (and therefore understand) why we needed to meet in a certain area of the city (Minneapolis/St. Paul, MN)! In any event, thank you much for your work on this tool. It is very useful! I sent you a PM and i thought I’d post the Q here as well. I’d like to share the maps I created with my friend via text/email. I noticed the links aren’t unique. How do I go about sharing my maps? BTW, love your site! Discovered it a couple days ago and have been using it to plot out points of interest from my past traveling! Thanks again! It seems more and more people are asking for this sort of radius tool. I will add it to my list of enhancements for the site. I created a map and it saved. It would not save a second map. I have redone it 45 times ; ) but no save ever. (Yes, I saw from above, it did not appear to still be geocoding.) Thoughts? I have a need to bulk load a large number of addresses, and have them displayed on a map. The load and plotting work fine, but the map fails to save – probably because of too many addresses. The current number is around 400 addresses. Any work around? Btw – love the tool!! There was a bug in handling saves & updates to large maps, which I just fixed. Please give it another shot. Sorry for the inconvenience! What a great site you made, very nice! I was mapping some addresses for a hobby project and the bulk creation works really well. 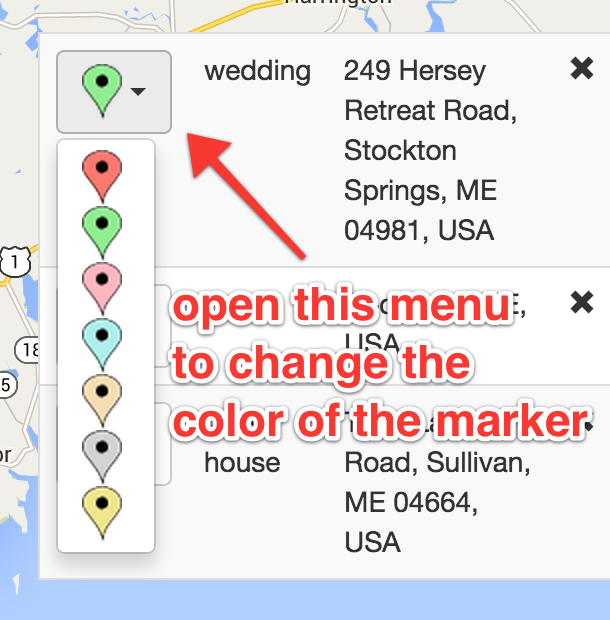 One big improvement for me would be when it is made possible to enter the preferred marker color per address. Now it plotts all addresses to the default color, where it would be nice when i can add something like or behind every address line? Thnks already for the current version & looking forward to the next! Hi Patrick, love this tool but it does not save, I have 15 locations and trying to add locations and I have tried over and over and they do not save, I see someone above had the same issue and you stated that it was fixed. Checking to see if my problem is the same or maybe I am doing something wrong. I’d like to access the maps from my android phone. When I go the to URL, it comes up, but half the screen is an ad. Is there a way to eliminate the ad (pay for subscription etc)? I will work on implementing a way to specify the marker color while bulk-importing addresses (similar to how you can specify the description of the location). When you paste in a bunch of addresses, the site needs to convert these addresses to latitude & longitude coordinates. To do this, it makes a background request to a service run by Google Maps. There is a limit to the number of such requests that one person can make in a short period of time, so when it hits this limit, it will pause before sending the next request. When this happens, you will see a spinning icon over the bulk entry area, and it may appear as if nothing is happening. If you scroll to the bottom of the location list, though, you should see that one or two new locations are added to the list every couple of seconds. If you let it sit long enough, it will look up all of your addresses, and the spinner will disappear from the bulk entry area. Does this sound like what you are seeing, or are you having a different problem? I will see if I can make the ads smaller on mobile phones. I just wanted to say how awesome this website is, I am not sure how I stumbled upon it, but it is perfect for my wedding venue research! I have plotted all the venues and can easily see which are close to each other so I can see them in one day! I love this and will be using again for sure! First of all, love your site! I use it almost daily and the bulkadress is a really awesome feature. The radius/distance that some people have suggested really sounds like a good idea as well with being able to colorcode markes at the bulkimport-stage. i would also love to see a function where you can select two of the points and get a suggestion on how to travel between those selected points using google maps if its possible, or even select multiple points and one “goal” to see which travelroute thats the fastet. Not sure if its possible or not or the amount work it needs to get it done. Thought i’d just put it here for your consideration. I love this. Thank you for creating such a simple way to pinpoint addresses without the directions line you get with Google Maps with multiple locations. What I usually do is print screen and then alter in a free photo software called Gimp. I have to zoom way out and it diminishes the area I’m trying to show but if I could minimize those it’d be perfect. If not, I’ll work with what I got but if I’m missing something, please let me know. I really appreciate your help. There isn’t currently a way to minimize the address listing, but you might want to try experimenting with the print view. To print a map, you can use your browser’s built-in print functionality. You may need to adjust the zoom level and/or move the map a bit to ensure all of the locations are visible (because printer paper and computer screens are generally a different shape). You can use the print preview feature to help with this, so you don’t have to waste paper. You can also use the print-to-PDF functionality if you want a PDF copy of it. In the print view, the address listing will appear below the map, so it might not get in the way as much. thank you. I have 300 places I have to visit once a month. you’re mapping lets me visualize it & then I use mapquest travel bulk loader to map 26 at a time. I realize I have to go slower loading the map as I tried to load it alphabeticly by city but it didn’t end that way. What I would LOVE LOVE LOVE…. would be if I could click on the bubble on the map & change the color instead of trying to find it on the list. I attempt to change the color when I pick the places to visit for the day & then I attempt to change it to gray when I’ve finished. That is a great idea! I’ve been thinking about how to structure the user interface to allow editing the locations on the map (not just the colors, but make it possible to edit the description, or even the address as well), and editing in the location bubble is not something I had thought of. It makes a lot of sense, though. A few extra addresses popped up on my map and I can’t seem to delete them. It was addresses in other cities that match the street address. I’ve already saved them map. It doesn’t matter if I edit or where I click. Any suggestions? Thanks! P.S. I am so thankful for your site – I believe it will make all of my running around that I do on a regular basis much more efficient. Hi Meredith, I’m glad you like the site! Don’t forget to save your map after editing, and you should be all set! Thanks for this nice website! I was just looking for something like this! I have a concern. I created a map before creating my account. As soon as I saved the map, I had no control on it! It was unexpected! I understand that I was not “trackable”, but I didn’t even close the browser… Is there a way for me to delete this map? How long do you keep the maps and data of visitors? Please advise me about that. As a suggestion, there might be a warning while the map is saved. I assumed that it was temporary, but suddenly it was saved permanently!! Or maybe guests should not be allowed to save maps with a permanent link (temporary link is fine). Thank you for the great site! I use it every month. My question to you – is it possible to have the numbering of addresses go beyond 99? I always plot more than 100 addresses at a time and have to print and hand write the numbers past 99. Thank you so much for your time and attention to this matter. I like your site. I read some comments about people wanting to link points together to work out the best route, I gather to deliver things. If you are getting latitude and longitude readings from google can these ‘location readings, geocodes’ be made available and then be used with the address and people can plot or determine their own best route? I replied via email to coordinate deleting the map, but I like the idea of a warning. Normally, you can still edit or delete maps that you create, even if you are not logged in, except if you have ‘Do Not Track’ enabled in your browser (some browser versions have this enabled by default). In that case, my site will not associate any of your actions on the site with you, so any maps you create will not be associated with you. I’m not entirely sure I follow what you are saying, but I am investigating some ways to include route-finding into the site. I’m also hoping to add KML & GPX exports, so people can download their map data in a standard format, and do what they wish with it.